For the past couple of years we have made a gingerbread house for our family's children to enjoy at Christmas luncheon and this year is no exception. Edward has also been very keen to make a Nativity Scene, to celebrate the true meaning of Christmas. The actual gingerbread components were purchased in a kit from Ikea. Gabrielle made some icing from pure icing sugar which doubles as glue to stick the pre-fabricated components together. The white icing also gives a snow like effect. Although snow has no physical relationship to the Christmas period here in Australia owing to 25 December falling in the middle of our summer. However due to the British, European and North American influence on our culture the visual and psychological association of snow with Christmas is surprisingly strong. Besides, it gives us something with which to stick the confectionery to the gingerbread. It's a little hard to see in these photographs but the finishing touch is a small chocolate Santa Claus peeping out of the chimney. The finished product is something that kids love, and it looks festive too. Next, Gabrille and Ed made a Nativity scene. These wooden clothes pegs become the figures. A shoe box becomes the stables. The manger is made from some light cardboard cut up and shaped into a box. The clothes pegs have a piece of shiny pipe-cleaner like things wrapped around them to make arms and a couple of pieces of tinsel stuck on to make a beard for Joseph. Clothes are made from some scrap material. To make a smaller figure for baby Jesus the bottom of one of the pegs is cut off to size. His bedding is made from cotton wool, as is his blanket. The gabled roof of the stables is made from an inverted vee shaped piece of cardboard topped off with the guiding star. Some spiked leaves from a palm frond make up some greenery around the stables. H.M.A.S. Edward. Australia's newest submarine. 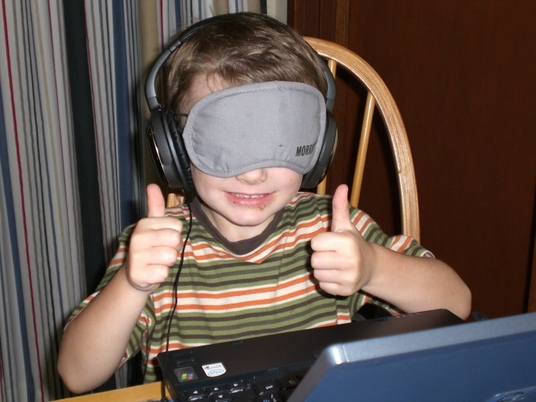 Kids just love playing with cardboard boxes and pretending. For the past couple of years as my profile photograph in the top right hand corner of this blog I've used a pic of Edward sitting in a cardboard box. Drawn on the outside is a Big Red Car. Nowadays Edward is quite interested in submarines, so I thought I would make one for him. Here's how to make a cardboard submarine. I used a large cardboard carton which enclosed a table we recently bought. I slit the carton along one length and folded it to create a flat base. I drew the rough outline of a cigar shaped submarine with conning tower on the parts of the cardboard sheet which would become the sides of the vessel. Then cut it out using a small pruning saw. This is the best tool for cutting through thick cardboard. Then I folded the sides upwards and secured them with tape across the top and around the nose area. 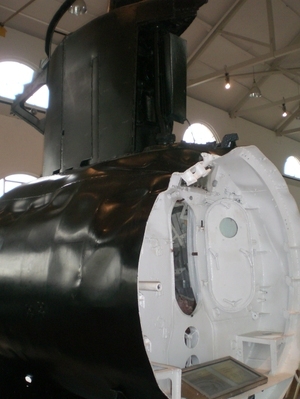 The back of the submarine was left open to give children easy access to the inside. A piece of excess carboard was rolled up to make a tube about 10cm in diameter for the periscope. In turn, the periscope was also taped in place. Finally came painting. As you can see, the classical cigar shape was emphasised with a black outline. The writing is in red colour because that's Ed's favourite colour. The green, red and yellow splotches are just to create some visual interest and break up the solid surface so it looks a bit less like a cardboard box from the outside. The submarine was designated number B5 because it will be Ed's fifth birthday. H.M.A.S. 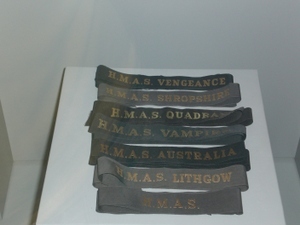 was used because Edward understands they are the prefixes for all Australian Navy ships and submarines. And "Edward" - well all kids love seeing their names written on things. As well as playing with boxes, kids also like making tunnels out of things, so by leaving the back of the submarine open and having the ceiling of the conning tower arching over the top a bit of a tunnel feel is created too. A finishing touch is a tin foil cake pan at the top of the periscope to represent the lens. And so it goes. Edward learns the craft. This is a photograph of the tool board in my father's workshop. Most of the tools here are more than 50 years old, and few are less than 30 years old. I was taught that if you look after things they'll last. Dad's workshop proves it. The skills I have in making, repairing and constructing were learnt at my father's elbow. And now Edward gets his first lesson on sawing wood from his Grandpa. Down at Mosman, near Balmoral Beach there is a statue of Billy the dog, who was well known as the companion to Inky the street sweeper from 1959 to 1978. 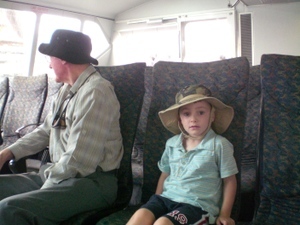 In July 2005 we took a photograph of Ed with Billy and again today, three years later. How quickly they grow up. The statue of Billy is by Denis Adams, according to Mosman Council, however the artist is much more likely to be Dennis Adams..
Last week Edward asked to go to the Powerhouse Museum, which if I had to categorise it, I'd say is a museum of technology, science, decorative arts and design. So today we made the trek to Ultimo and met up with Ben and Lauren and Edward's cousins Thomas and Eloise. We especially got Ed excited about visiting the zero gravity simulator which is part of the Space exhibition. The Zero-G simulator is comprised of a stationary platform upon which the astronauts (kids) stand surrounded by a cylindrical shaped mockup of the inside of a space station. The cylinder slowly rotates to simlulate a space like experience. To the astronauts, nothing much seems to be happening, but when you walk out onto "earth" again, it is quite disorientating. Thankfully there is a rest area, which I suggest you use. On the way to the Zero-G experience, then kids also had the chance to be photographed looking like space travellers as they stuck their heads through the painted backdrop. An oldie, but a goody. Later the boys had the chance to dress up in astronaut costumes. There were alien costumes too, but they didn't have the same attraction. Apart from these obvious novelties, they had some great fun in the Experimentations area which displays pratical examples of some of the fundamental physics of electricity, light, and magnetism. In this pic, Edward is using a hand cranked generator to power a toy electric train and send it around a small track in the enclosure. I know that when Ed said last week that he wanted to go to the Powerhouse Museum, he had in his mind seeing the steam engines on display. The museum includes on permanent display Locomotive No. 1, which was the first steam locomotive in Australia. Made in England by the Stephenson works, it was transported to Australia by ship and put into use in 1855. I see from the nameplate data, that it was in fact No. 958, as far as they were concerned. There is also an engine built in 1882, Locomotive No. 1243 on display and Edward was able to stand on the footplate and operate a few controls. the display is interactive, and as buttons are pressed the voice of a driver or fireman explain the workings. There's a section called Zoe's House, which is a contruction and building activity for kids aged 3 - 6. Ed, Thomas and Eloise all loved this. The Powerhouse Museum is well set up to light the imagination of children, and as you can see has lots of things for them to do, see, and in which to be invovolved. But there's also rareities to interest military historians like me. This enigma machine is part of an exhibition, and was used to create coded messages by the German Army in World War II. Breaking the codes made by these machines was a turning point of World War II. There are two other known specimins of these machines in Australia. 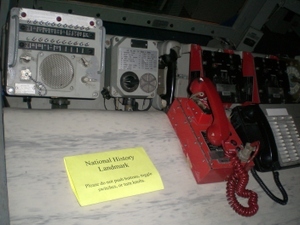 One is held by the Australian War Memorial, and one held by the government information security (cryptological) agency Defence Signals Directorate; although both are owned by DSD. The children all enjoyed taking a break in the courtyard cafe which has some state of the art play and climbing activites, including this giant climbing frame which can be enjoyed by kids of all ages, including this 40ish man who could not resist climbing to the top. I managed to control the climbing impulse. Now, it wouldn't be a visit to a museum if we didn't manage to find an error in a curatorial plaque, and here's the result from today. There's a display about the work of violin maker William Auchterlonie (perhaps part of the famous golfing family?) and the plaque says that," This page is open to 1924, the year the violin on display was made." But it is clearly a page from 1934. He had been using a day-to-a-page diary from 1930, and the day for that page, Tuesday January 28th, 1930 is crossed out. Auchterlonie's note begins, "Started in 1934 Beginning of November ..."
Edward asked to return to the Zero-gravity simulator, and the engine Locomotive No. 1243 - so I guess they must be the best things in the museum today. Edward sees his first circus show under the Big Top. You never forget your first circus. Today we took Ed to the Big Top at St. Ives showgrounds to see Weber's Circus. This is the real deal. The arena is releatively small - which ensures that every seat has a great view of the action, although some may be slightly obscured by the solumns holding up the tent. The local government doesn't permit the use of animals, but in every other respect there is a full range of top circus acts. Solo trapeze, aerial steel ring, clowns (non-scary), contortionist, tightrope walk, juggling, dancers, aerial silk act, multiple hula hoops, and an honest to goodness wheel of death. Edward's attention was captured for the nearly 2-hour show. Something he will never forget. He told me the popcorn was good too. The circus strikes the big top tomorrow, and then goes to give shows at St. Mary's and Liverpool. See if you can get along there. Tell them Bob sent you. 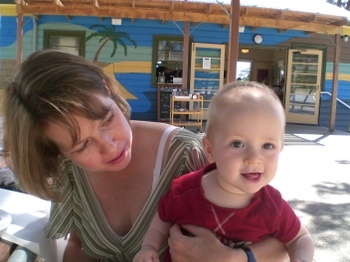 A couple of days ago we met our friends Alana, Sean and young Luca at a cafe on a headland above Mosman. It's an amazing park with an amazing view. Set on a site which was once an artillery emplacement used to protect Sydney and its harbour it has been refurbished to provide studios for artists and a setting for a sculpture park. As a homage to the site's military past there is also a preserved inoperable 6-inch Mark VII coastal gun on display. 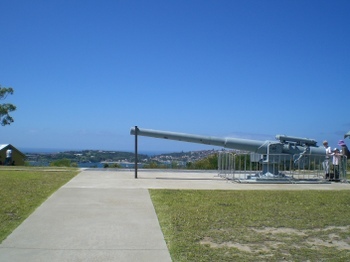 According to historical surveys, the two World War II era Mark VII guns were moved from this site to South Head so this one must have been retrieved for dramatic effect. In this picture at left we see the 6-inch Mark VII gun which was manufactured by the venerable British armourer Vickers. The "6-inch" statistic relates to the internal diameter of the gun barrel, and hence the external diameter of the projectile shell. The shell weighed around 100 pounds (48 kg) and the range was about 15 kilometres. This photograph above gives a better idea of the gun's tactical field of fire, although this was not the exact position of the gun emplacement. 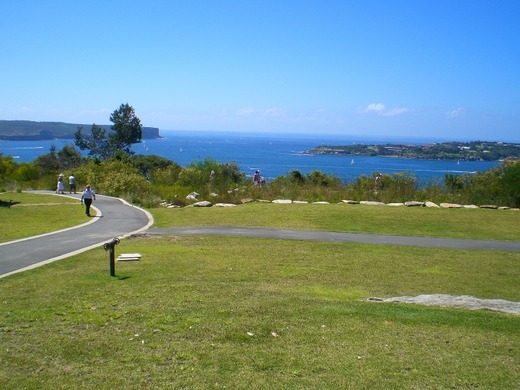 Sydney heads, the entrance to Sydney Harbour can be seen in the distance, North head at left, South Head at right. Edward has seen the big gun before, but it still acted like a magnet to him. 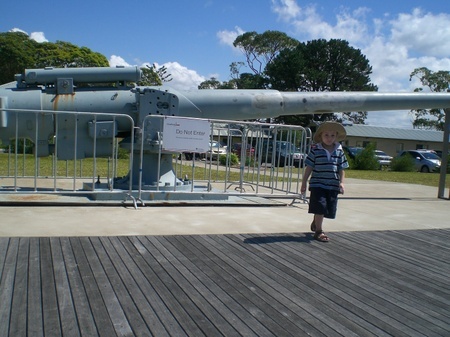 Not so much because he has an interest in things military like his Dad, but because it is just so big. And because it now has a fence around it - just making it so much more attractive to a young boy. 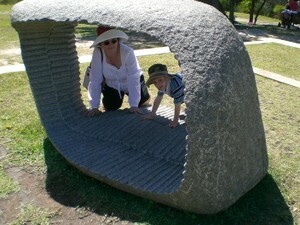 Ed also took some time out from military history to give vent to his artistic side and appreciate some sculpture. Not so much from the aesthetic aspect as the athletic. On Friday my father who is in town visiting, Edward and I went to the Royal Australian Navy's Heritage Centre at Garden Island, Sydney. Garden Island contains the RAN's Fleet Base East and the Garden Island Dockyard and as such there is restricted public access only to a segregated area on the North-eastern tip of the Island. Access is achieved by taking the Watson's Bay ferry from Circular Quay, which stops at Garden Island after a 6-minute trip around the Sydney Opera House. Entry to the museum style gallery is free for kids, and costs $5 for Adults. The Gallery has a large display which is drawn from some 300,000 artifacts which the RAN holds in its extensive archives which are otherwise unavailable for public viewing - so whatever goes on display must of necessity be a carefully chosen sample. I'll mention a few items and make some commentary. 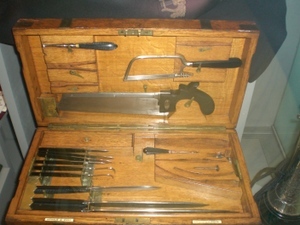 Although there was no identifying curator's plaque, this is a Naval Surgeon's amputation kit (incomplete). Made by Arnold & Sons, a British surgical instrument maker. The handles appear to be cross hatched ebony. The long bladed knives at the front are Liston knives; their use is for cutting through muscle during amputation. They were developed by a Crimean War (1854 - 1856) surgeon, Dr. Liston. This dates the kit as being from after that period. The work of Joseph Lister (different spelling) in 1867 led to revelations that porous material should not be used for the manufacture of handles on surgical instruments due to their propensity to harbour germs. Hence this kit can be safely dated between 1854 and 1870. The whole kit is contained in a chest made from mahogany with brass reinforcements. 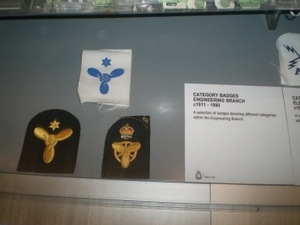 The woven propeller badge with star insignia at lower left is similar to that worn by my father on his uniform during WWII. The badge in blue motif on white background was worn on coveralls. These cap tally bands include one for H.M.A.S. Shopshire and at bottom a simple H.M.A.S. without a ship's name. Both are as worn by my father in wartime. 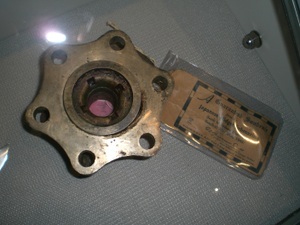 This latter type was worn by sailors during wartime as a security measure to reduce intelligence on ship movements available to the enemy. Without doubt the most popular exhibit in the gallery was the Attack Periscope Type CH74 built by Barr & Stroud from an Oberon Class Submarine. 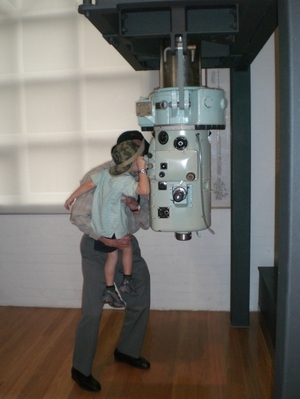 Here is a pic of the oldest person in the gallery picking up the youngest person in the gallery to have a look through the monocular eyepiece of the periscope. The other end of the periscope is about 13 metres above through the roof of the building and may be rotated through a full 380 degrees. It's the real deal. 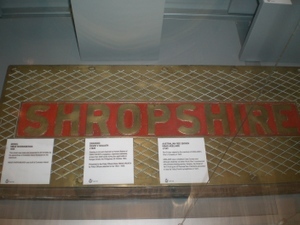 This large brass plate displaying the word "SHROPSHIRE" is not described by a curatorial plaque, and an identical large brass plate also appears in another part of the gallery again, not described. My father believes it dates from post-WWII, as in wartime all identifying names were removed from the outside of the ship for security reasons. Some slightly more modern technology was also on display like this Radar indicator Azimuth Range SRA-66 from a guided missile destroyer of the Charles F. Adams class (DDGs) such as HMAS Hobart, Perth and Brisbane, each of which saw action in the Vietnam War. You can see that Edward was keen to test his ranging skills. He also spent some time on the torpedo aiming unit from a submarine which can be seen in the left of the pic, and the sonar unit out of frame to the right. All of the controls on these units are in working order, however they are not connected to any power source. Edward could turn the wheels and flick the switches. Having been built to naval specifications they are quite hardy. Here is a mock-up giving an idea of ship-board living conditions. 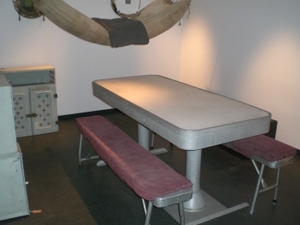 I asked my father if he actually slept in a hammock aboard ship, he confirmed that he did so, but said that it was preferable to sleep on a bench like the one beside this meal table or if a sailor was lucky enough to have a mattress, he would sleep on the deck. On the night of 31 May 1942 three Japanese midget submarines entered Sydney Harbour and engaged in what became known as the Battle of Sydney. One of the subs torpedoed HMAS Kuttabul, sinking it and killing 21 RAN sailors 19 RAN and 2 RN sailors. As a boy I visited the Australian War Memorial in Canberra and remember seeing a hull section of one of the midget submarines on display in the AWM forecourt. I should have wondered where the conning tower section of the sub was located, but never did. The RAN have been holding onto it all these years, and now it is on display here. it's worth noting that the display about the Battle of Sydney and the conning tower of the Japanese Midget Sub are on display in the large entry hall to the building, and as such are available for viewing without paying the $5 entry charge to the Gallery,. Somewhat amusingly, later in 1942 sections of the two captured/salvaged Japanese midget submarines were taken on a tour around Australia to raise money for the Naval Relief Fund, and parts of the sub were sold off. 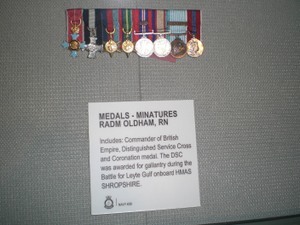 In an otherwise admirable curatorial job in the Gallery display, my father did spot one factual error.The medal miniatures of Rear Admiral George Carmichael OLDHAM are on display, noting his award of the Distinguished Service Cross whilst aboard HMAS Shropshire during the Leyte Gulf Operations (He at that time held the rank of Commander). The accompanying curatorial plaque incorrectly identifies his service as "RN" (to denote Royal Navy), however it should be "RAN" (to denote Royal Australian Navy).Perhaps the error occurred in confusion with Captain R. W. OLDHAM who was of the RN, and who was the first Captain of HMS Shropshire when she was launched into the Royal Navy on 5 July 1928. A digital image of Rear Admiral G. C. Oldham's service card may be viewed online at the National Archives of Australia. I know that there is a good deal of interest in Siebe Gorman diving suits and equipment around the world, because the blog post I wrote about Siebe Gorman perinnially gets lots of hits. 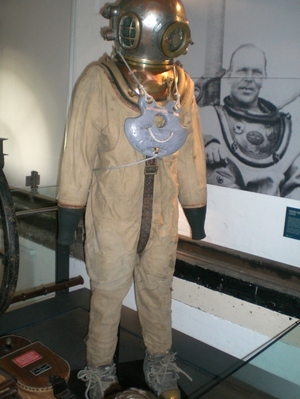 The Gallery has an outstanding example of a Siebe Gorman diving suit, again with a six bolt helmet complete with the machinery to supply air to the suit and the electrical voice communication set. During World War II, the RAN's biggest ships were the Heavy Cruisers HMAS Australia, HMAS Canberra and HMAS Shropshire. They were each armed with eight 8-inch guns, and here is an example of one of the gun barrels from HMAS Australia. 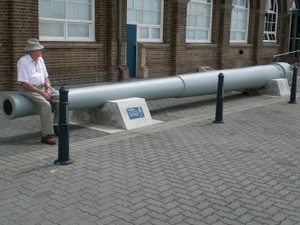 The gun barrel is just over 10 metres long. Depending upon the charge and projectile used, the maximum range was about 28 kilometres. And here is photograph of HMAS Shropshire firing an 8-inch gun broadside. In summary, this is a great litle museum... I'd even call it Australia's best small museum. Even the journey to Garden Island is via a memorable Ferry trip passing between the Sydney Opera House and Fort Denison. 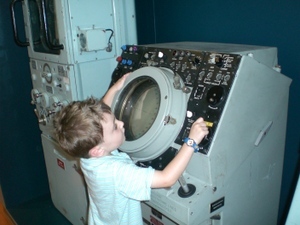 Visiting the museum with a 4-year old boy, I appreciated the fact that he could enjoy mucking about with the Radar Indicator unit (pictured above), and I contrast that with the environmentt on the USS Missouri Battleship Memorial where it is monstly a look but don't touch situation, pictured below. A question Dear Reader? Put it in the comment section for a response. Want a high resolution copy of any of these photographs emailed to you? Put your request in the comment section for a response. 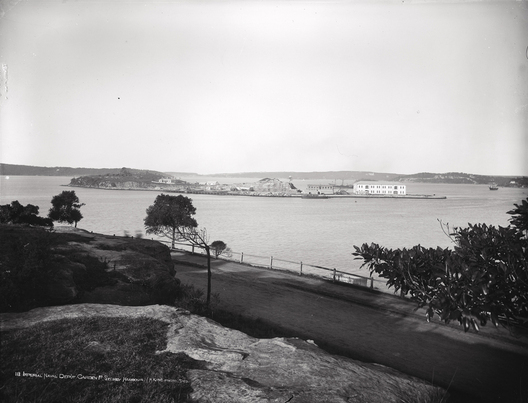 Note that the island is truly an island at the time this photograph was taken. Nowadays it is joined to the mainland at Wooloomooloo, as can be seen in the Google Maps image at the start of this blog post. 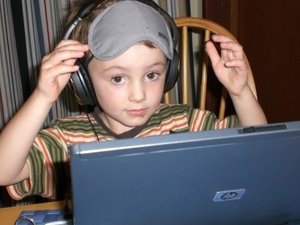 Gabrielle returned from a trip today, and gave Edward the sleeping mask she received on the flight. 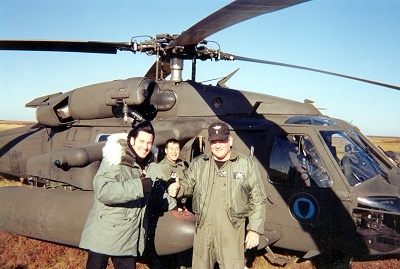 he thought it looked like a helicopter pilot's helmet visor, and with the addition of a hedset, he was ready to fly. So, he had to give the traditional thumbs up signal. As it happens, he was listening to Blondie's Hanging On The Telephone through the cans.